1. Login to IMCreator and edit/add a new page. 3. Edit HTML to open up the Raw HTML Settings and Paste your Form's Iframe Embed Code. 2. 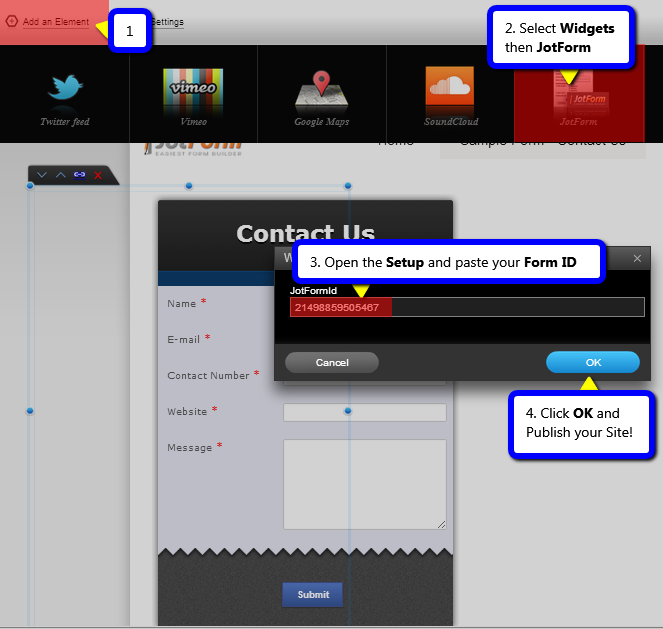 While on edit mode, click Add an Element, select Widget then select JotForm. 3. 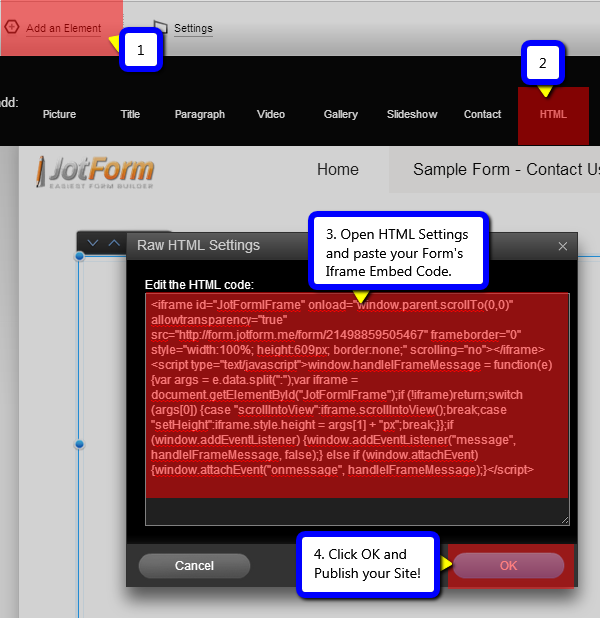 Open JotForm's Widget Setup and paste your Form ID. If you have questions with any of the steps above, you may post it below. Thanks! The second option works fine...never tried the first option. I wasn't able to paste the form ID on imcreator, so entered it manually. So far, all buttons seem to work. Thanks for the opportunity imcreator, I really enjoy creating my website from scratch. Thanks to you as well JotForm, I appreciate you both!! As Taylor stated in his post Method 2 doesn't work. The setup button doesn't work to let you put the JotForm number in. Hey, Mark from IM Creator here - we recommend the second option, adding just the JotForm number under Add Element > Widget > JotForm. I tried both methods and was unable to successfully add the form. The form was blank when I tried it in IM Creator (and I checked to make sure the form was working in JotForm). Method 2: the "setup" button doesn't work so I can't configure the FormID. Wie kann ich meine jotform einbinden auf meinen IMCreator Website?